Meet the one and only, Trevor Dickinson, the man who’s giant quirky wall murals put Newcastle on the map. From the humble beginnings of Newcastle Productions‘ zines, tea towels and cards to painted murals that animate Newcastle’s city walls, Trevor has done it all. After years of designing for the fashion industry, Trevor moved to Newcastle and away from his computer. In his most recent project, the weirdly obsessive artist, spent nine months visiting almost every street in Newcastle scouting out 100 unique Australian letterboxes to draw. Trevor chats with TDK about his journey and creative influences. Tell us about yourself. When did you start illustrating and how did it become your career? I’m an English designer specialising in graphics and textiles for the fashion industry. I used to do this in London, then I moved to Newcastle twelve years ago. I started drawing on the streets of Newcastle in 2009, as an excuse to get off the computer and out of my studio. Pretty soon I became obsessed with making new drawings and I wanted to do something with them, so I collected them in zines. This expanded to tea towels, cards and prints and I sold them locally under the brand Newcastle Productions. Newcastle Productions changed from a hobby into a career when I was accepted as artist in residence at Megalo print studio in Canberra. This gave me the time to draw the city and make a body of work that I could sell on a larger scale in Canberra galleries, museums and shops. You have a particular way of drawing. How did it come about? Any obvious influences? I was into Marvel comics when I was young, at the time the English editions were in black and white and I started to notice the different styles of the artists through their drawing styles. At the time my favourites were Steve Ditkoand John Buscema. My recent influences have been Robert Crumb’s drawings, not so much the comics, but the landscapes, his drawings have a very human touch. I also love Evan Hecox‘s precise city and truck prints, he uses line beautifully. I have also been inspired by the flickr group, Urban sketchers. I like how line drawing reproduces well in all forms, reduced in a Zine or enlarged on a screen printed tea towel. In an age where everything can be rendered perfectly on computer I think hand drawing is appreciated even more than ever. This is why I try to keep imperfections in my work. Any advice for students/graduates wanting to gain more exposure? I can really only talk about my own experience. I regularly update my facebook page and flickr account but my main exposure is from the shops that sell my work. I recommend Zines as a great way to get the work seen, they are a perfect low cost outlet for images, I sometimes use my zines as glorified business cards. People still like to see things printed. You’ve done so many projects along the way from your 100 Letterbox’s series to zines and more. Which has been your favourite? My favourite is definitely 100 letterboxes, because it’s such a neat project. It had a structure and a clear goal right from the start. It highlighted part of our environment that is in full view but never really noticed. I spent nine months visiting almost every street in Newcastle to find good letterbox examples to collect, select and draw. Seeing the project finished and exhibited felt amazing, not only because I managed to complete the goal, but it was great to see how the public responded to seeing such a collection of Australian artifacts lovingly drawn and put on display by a weirdly obsessive artist. Newcastle has obviously influenced your designs, so what’s going on over there. What’s the creative scene like? The creative scene has been thriving for a while, but Renew Newcastle has definitely made it a lot more visible. A walk along Hunter Street Mall is like being in a funky new city compared to how dead it was five years ago. It definitely feels like a scene has developed in recent years. Blogs like the Novocastrian files and events like Look Hearand TINA have also helped spread the Newcastle word. Having said that, like any city, under the surface there are many more creative people who are just getting on with their jobs and not part of any scene, I occasionally meet people who are working at a high level in their careers and realise that I had no idea that they were out there. What’s on the cards for 2014? I still work in the fashion industry and have a few new projects to work on for companies in Sydney and London. I’m aiming to get an exhibition in another Australian city, this will give me a deadline to work towards. I also need to urgently update the Canberra drawings as I haven’t had time to revisit the city on paper for a while. Not having enough time to do everything is my biggest frustration at the moment. It’s wonderful to be gathered here at this remarkable place that is surely (in spite of the weather) one of the most sublime exhibition venues in Australia. We’re at the hiding place of the Great Kangaroo and we know this because of the stories told by the Awabakal people of the past and the present, people whose songs, stories and ceremonies nurture this site, and will continue to do so for many generations to come. Trevor had a birthday coming up a while back and I joked that I’d buy him a ruler because he was completely rubbish at drawing straight lines. I was reminded of that exchange when I looked over the work that Trevor had assembled for this exhibition. There’s still not a straight line in sight but Trevor’s unconventional approach to his subject matter is part of the reason why his drawings are so successful and so popular. Trevor’s subjects are grand but he represents them on a human scale and in doing so he brings their eccentricities and unintended foibles to our attention in a way that’s humorous without ever being snide or malicious. Humour is the golden thread that runs through Trevor’s work. The Establishment tends not to value humour in the visual arts but The People love it. Certainly Novocastrians do – can anyone remember a pre-Dickinson Newcastle? – and Canberrans embraced him with similar enthusiasm. Even Sydney’s beginning to catch on. But how did he get to here? Trevor and I are children of Sixties England. As kids in regional England many of our cultural landmarks were the same. However, when we left school I went to work to earn a living and pay taxes while Trevor swanned around London wearing pirate shirts and girls’ eyeliner. How I envy him. Art schools are places where the talented gather but talent is a cheap commodity; in the world of the creative arts talent is simply a starting point. To be successful and to make a living from your artistic practice you need other ingredients: commitment, a strong work ethic, determination, a thick skin, ambition – characteristics that, in the world of the arts, are often viewed through narrowed eyes. Trevor has these qualities in bucket loads. His work belies the research, the effort and the late nights that go into its creation. Its quirky nature, chirpy mix of colours and its ever-present humour deceive us. Surely something that appears this simple can’t be hard work? It is. Anyone who knew Trevor during the research for his 100 Letterboxes of Newcastle project knows just how much legwork went into it. In fact we all got sucked in. A small army of people found themselves on the lookout for the weird, the wonderful and the bizarre letterbox. And of course the perfect 48, a significant number for Trevor that year. I mentioned earlier the Dark Ages of pre-Dickinsonian Newcastle. Like Athena bursting from the head of Zeus fully formed he seemed to appear with a completely matured style. His drawing style has changed, something you’ll notice if you compare this current batch of work with earlier pieces, but as you look around this exhibition I want you to look for the development of something else, something that I’ll choose to call Trevor’s falling in love, at first with Newcastle and then with Australia as a whole. After the bright lights and breakneck pace of London, Trevor struggled a little with suburban New Lambton. It was only when he got on his bike that he started engaging with the New World around him. Cycling in Newcastle changed the pace at which he viewed his new home and gave him the time to pause and re-see his environment. That early period of drawing saw a burst of creativity driven by Trevor’s personal sense of urgency. Those attributes I mentioned earlier – talent, determination, commitment, a strong work ethic, ambition – resulted in a huge output over a relatively short period of time. Within a few months his tea-towels were in every kitchen, his prints on every wall, his murals on every flat surface. 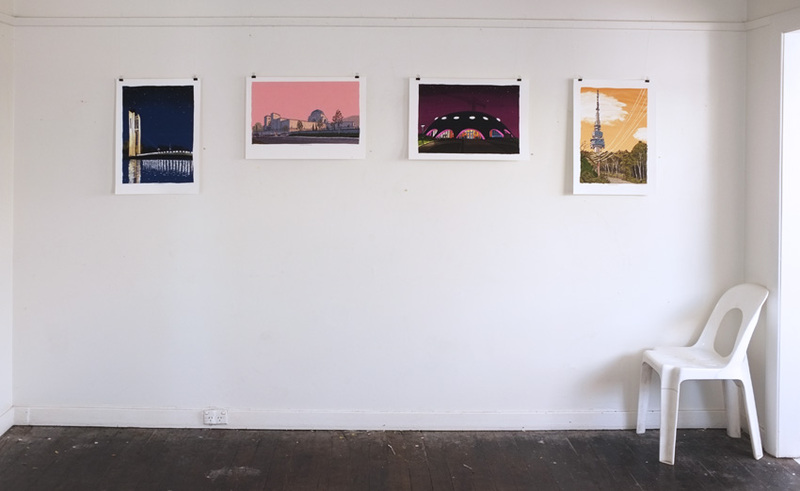 A residency at Megalo print workshop in Canberra opened up a new world to the sly parody that’s become his trademark. And then Sydney got the treatment. Brisbane awaits with bated breath. I mentioned at the beginning the story of the Giant Kangaroo who rests inside this island. That’s a story about place, and this exhibition that Trevor has gathered together is just as much a story about place. He’s taken those aspects of our city that have become invisible to us through endlessly repeated viewings and then surprised us by skewing them a few degrees, just enough to reveal the mundane in a completely new light. And all without the use of ruler. I’d be wasting my breath telling you that Trevor’s good at what he does: you know that already. But if you want to see more of his work in the future then don’t leave without buying a print, a tea-towel or a fridge magnet. His glamorous assistant will be more than happy to help you.